What is the easiest, cheapest, most impressive brunch dish ever? And delicious? Gorgeous Oven Pancake! It’s a kind of a cross between a crepe and a pancake, but much easier to make than either. It has been a standby of cooks in various countries, called various names like Pannekaken, Dutch Baby, or even Hootenanny Pancake. We first tried it when our friends from Sweden made Pannekaken (literally “pancake”) for us. Oven pancake is impressive, yet very inexpensive and goes together in just a few minutes. Then when it emerges from the oven you have something really beautiful to offer your guests or family. Great for any holiday and most house guests! 1. Put 5 Tablespoons of butter in a 9″ x 13″ pan and then put the pan in the pre-heating oven. As soon as the butter is melted take the pan out and leave on top of stove. If the butter turns a little bit brown it’s ok–it won’t affect the flavor of the pancake. Do NOT use unsalted butter for this. Use salted butter. 2. Put 4 eggs in their shells in a bowl of hot water for 5 minutes. After that open the eggs and put them in a blender along with one cup of milk that you have warmed in the microwave for 20 seconds on high. 3. Start blending the eggs and milk with 1 teaspoon vanilla. Add 1/4 teaspoon salt and 1 cup of flour to the blender and blend until all is mixed in. 4. Pour this batter into the baking pan and place the pan in the 425 degree oven (be sure it has reached that temperature first). Bake 15-20 minutes. The pancake will puff up around the edges and corners. If it has not puffed up by 20 minutes in those areas, keep it in as much as 5-10 minutes longer to have it puff. Keep a watch on it to be sure it doesn’t burn on the puffy areas. Once it puffs on the edges it’s ready to come out of the oven. It probably will not puff in the middle. Even if it does puff up in the middle, that part will deflate quickly after you take it out of the oven anyway. Serve immediately. This can be a dramatic presentation if the middle puffed and then deflates. Immediately add fruit to the center. A pretty way is to spoon some fresh sliced strawberries onto the middle of the pancake, sprinkle with lemon juice, powdered sugar and possibly a drizzle of honey or maple syrup. Some whipped cream, sour cream, or Greek yogurt can be added to individual servings or to the top of the fruit of the whole pancake if you like. Any fruit can be used, including cooked apple slices with cinnamon and sugar when fresh berries are not available. A less dramatic version is to just serve the pancake with lemon juice and powdered sugar sprinkled on top and to let people choose their own toppings. Or serve the pancake plain with a choice of jam (strawberry, apricot, and orange marmalade are very good on this) or syrup. You can make a wonderful fresh fruit sauce by cooking fruit in a saucepan with some sugar and crushing some of the fruit. Stir in a little cornstarch that you’ve combined first with a bit of cold water to thicken the sauce if you like. For more ideas on this click on the label “fruit sauce” below this post. Your imagination is the limit with this pancake. Any leftovers will be devoured for snacks. While it’s most irresistible when warm, I think it’s good at room temperature and even cold. I did the first person research on that when I made this! Anything for science. 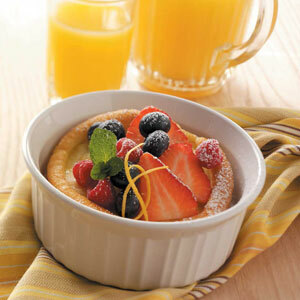 This oven pancake can be made as individual servings in ramekins or even in muffin tins. If you have souffle dishes they work too. I don’t know what the oven times would be for those, so you’d have to check often to be sure they don’t burn. You could probably make these in a toaster oven also. Give this recipe a try with your family to see if you like it. Some kids really like this even if they don’t usually like eggs. Then you’ll be comfortable with the recipe the next time you want to entertain. This one could be requested over and over! Ooops, that’s supposed to be Mrs. 1500! Mr. 1500, I think you and Mr.s 1500 will enjoy this. Most people are not familiar with oven pancake and are so surprised by it. Have fun! Agree totally, Megan! Thanks for stopping by!